For more than a decade, CFAP has been raising awareness about the devastating effects of compassion fatigue on individuals and organizations. Our Founder Patricia Smith writes, speaks, and facilitates workshops in service of those who care for others in all caregiving professions. We strive to provide information and resources through our website, our Facebook page, media outlets, and through our parent organization website healthycaregiving.com. And we are always listening to your wonderful stories of courage and personal triumph. We are a small but extremely dedicated organization and we rely on donations and our materials to keep our operation alive. And we know there are many others out there just like us. 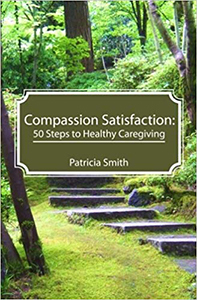 From now on, for every $1,000 we receive in donations, we are donating 50 sets of Patricia Smith's books, To Weep for a Stranger: Compassion Fatigue in Caregiving and Compassion Satisfaction: 50 Steps to Healthy Caregiving, to organizations across the nation that are in need of this vital first step toward authentic, sustainable self-care. With every $1,000 goal reached, we will post the organizations receiving the latest set of 50 books. Do you know of an organization that would benefit from having these books available to their caregivers? Drop us a line and tell us about them!